You can read my full recap of the Shamrock Half Marathon here. 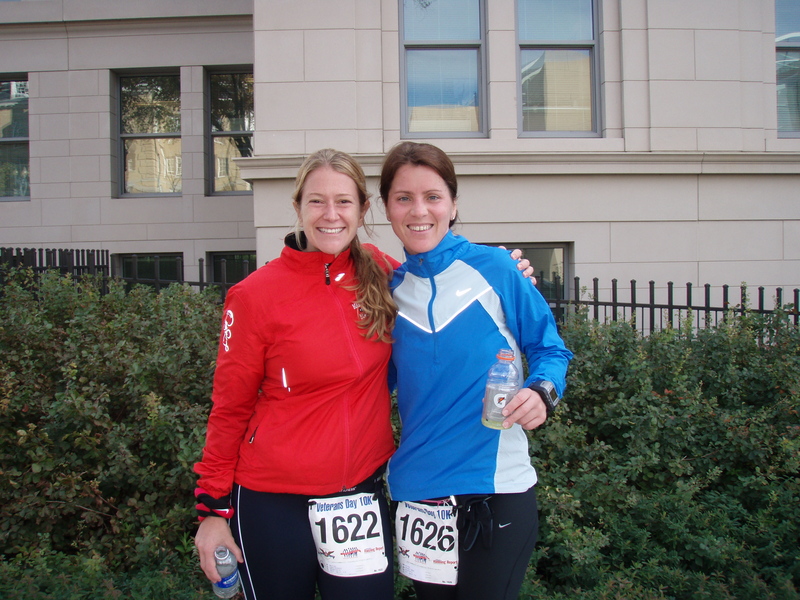 This was my first race of 2010, and my second half marathon. It was hard training for it, because DC got snow after snow, and the trails were not cleared. I had heard great things about the Shamrock Half in Va Beach, and it did not disappoint. The race was incredibly well organized and we got great schwag (a tech t-shirt, a reusable drawstring bag, a medal, a finisher hat, a finisher long sleeve t-shirt…). It was a fun race, with great spectators and friendly runners. It was such a good time, I’m looking forward to running it again next year! You can read my full race recap of the Cherry Blossom 10 Miler here. I was so disappointed by the organization of the race this year, that it ruined the whole experience. The course was crowded the whole time, people were bumping into me left and right, I had a really hard time dodging slower runners, and they ran out of water at the finish line. I don’t care if I’m not the fastest runner out there — if your cut off time is 2:20, you should have water for the very last runner that crosses the finish line! I still had fun though, as I was trying to keep Lindsay motivated and didn’t let her quit! My full recap of the Crystal City Twilighter 5k is here. This was the third time I ran this race and every single time I’ve ran it, the course was different. In 2008, its inaugural year, the course was very similar to the 9/11 5k race. In 2009, the course was changed to go up Clark St, which is one of those off the beaten path areas in Crystal City where there is nothing going on, just tow truck lots mingled with empty lots. This year, I loved the course! It provided enough variation from the 9/11 5k, and it was truly a Crystal City race, going up and down Crystal Dr, which is one of the main areas there. It was VERY hot this year, but the race organizers provided plenty of water stops (I think there were at least 5!) and the County donated water sprays to cool off the runners. We got a nice technical t-shirt, but the after party was lacking. Though there was plenty of beer, there were only bananas and Powerade provided at the end (when it inaugurated in 2008, Noodles & Company catered, so I got spoiled by the free food). My full recap of the Run Amuck in Quantico is here, with more pictures posted here. This is one of my favorite races! Last year I remember running it and thinking “why am I doing this to myself?” but finishing thinking “OMG, I gotta do this again!” This year I didn’t struggle at all since it was a bit cooler than the weather we had been having, but I did walk a bit, as I had a 17-miler training run scheduled for the following day. The course was slightly shorter than last year, and there were a lot less obstacles, with some of them being just damn stupid (like jumping jacks and situps — seriously? I want to climb a wall of mud, damn it!). I still had a great time! My full recap of the Virginia Beach Rock n Roll Half Marathon is here. This race was a LOT of fun! The expo had tons of freebies (a plus in my book!) and the race was well organized. As always, there were not enough port-a-potties, and there were also too much crowding to get into the corrals, but there was plenty of water stops, crowd support, and the bands throughout the course this year were GREAT. A lot of them looked like high school bands, but the guys were better than most other bands I’ve seen. We also got the COOLEST MEDAL EVER. A nice sparkly sand dollar! You can read my full recap of the 9/11 5k here. This race is one of my favorites! Not only it was my first race EVER, back in 2007, but I also hold the cause dear to my heart. Though I got a PR (YAY! ), the race course and organization is definitely not designed for PR’s. It’s crowded (about 3,500 people), there are no pace marks as in the past, walkers go smack in the middle of the start line, and the turns cause bottlenecks. But it’s a mostly flat course, going into Crystal City, then right by the Pentagon. There’s a very patriotic spirit about the whole thing, with speeches of local authorities and much firefighter/police and city government representation. The after party is one of the best around, with unlimited quantities of beer, burgers, hot dogs and pizza at the end. And you also get a medal — it’s the only 5k in this area offering a medal! 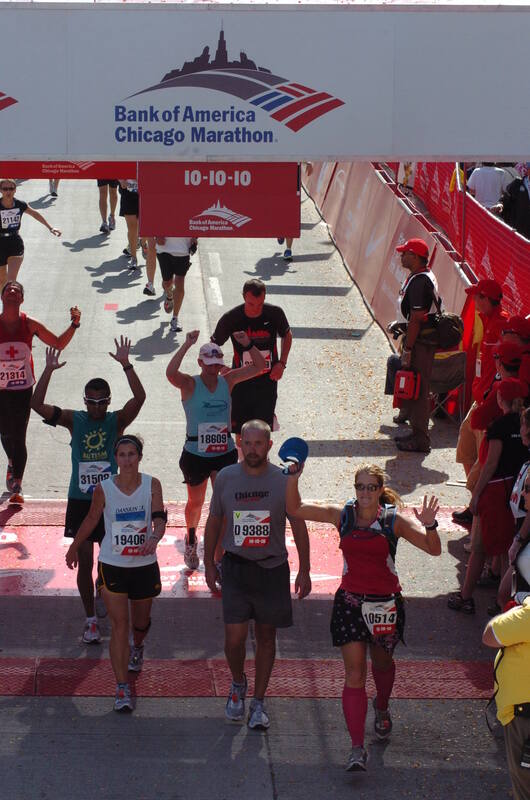 You can read my full report of the Chicago Marathon here. I absolutely loved Chicago (it was my first time visiting! ), and was super excited for the race. The route was not scenic however, and though the crowd support was spectacular throughout most of the course, but when I needed more, after mile 21 or so, there were no spectators. The start line was disorganized, the porta-potty lines were overfilled and not moving, but the course had plenty of them. The course was crowded the whole time, and I was dodging people left and right. The heat was unbearable (and the windy city had no wind! ), but they had plenty of water stops, water was being sprayed everywhere on the course, and they even had wet sponges for the runners to cool down. It was very hard, and despite training through the grueling DC summer we had, my training runs were all at 6am, and at noon I was still running in Chicago. The t-shirts were spectacular, but the medal sucked (HUGE Bank of America logo smack in the middle of it — looked like a promotional item not a race medal!). The finish line party was a disappointment (nothing going on really), but I heard that at the Charity Village it was great! Overall, though I didn’t enjoy my experience, I would still do it again. Heck, it made me want a redo and run the Marine Corps Marathon too! You can read my full report on the Army Ten Miler here. Despite the ridiculous crowded course, and the lack of organization getting people to their respective corrals, I still enjoyed running the Army Ten Miler this year. It’s a great course (save for the last 2 miles on the bridge), and the course itself is very organized, even if the start and finish lines were not. I wanted a PR and ran with friends the whole time. I didn’t stick around at the end, because I remembered from last year that there was nothing going on at the finish line area. All in all, I recommend this race though I really wish we got a medal instead of a coin! The best part? I blew my previous PR out of the water taking over 13 minutes off my time! You can read the full report for the Marine Corps Marathon here. Getting to the start line on Sunday was a nightmare, if I could do it over, I would have walked the 2 miles from home to get there. The race itself was fantastic — I wasn’t expecting much, heck the reason I signed up for Chicago is that I didn’t want to run 26.2 miles through the same stuff I see ever.single.day, but I LOVED the course. I also love that the entire the course support, including water stops, are provided by uniformed Marines. They don’t just hand you a medal either, they place it around your neck. Rosslyn is a mess at the finish line, and it takes forever to get out of the finish line area since it’s all fenced in, with only one exit, but it’s worth the hassle. I recommend this marathon to everyone, and will do it again in a heartbeat next time I’m in DC in October. Personally, it wasn’t my best of runs. I was wearing newish shoes, and my feet started killing me after mile 14, and it felt as if I’d be racing in uncomfortable high heels, every step was painful. But I only have fond memories of it. And despite the hills we hit early on, I got a PR! You can read my full report for the Veterans Day 10k here. I signed up for this race just a few days ahead of time, and ran it 3 days before I left to Rio de Janeiro, for my wedding and honeymoon. I was super stressed out with all the last minute stuff I still had to get done, and was battling the flu then. Despite waking up with a 100 degree temperature, I still made my way there. I missed the group, but ran with Hugi — who was not sick and was aiming to finish in under an hour (and she did!). I was feeling miserable the whole run! I had forgotten my Garmin at home, and had no idea what pace I was running, all I know is that I felt like throwing up the whole way. The course was SUPER crowded, and the out and back parts meant that even though you were staying within your lane, you still had to dodge people coming wrong way in the opposite direction (really annoyed me — stay in your lane, idiots!). But it’s not a bad course, since it’s completely flat, and if it wasn’t for the crowds, anyone could PR there! 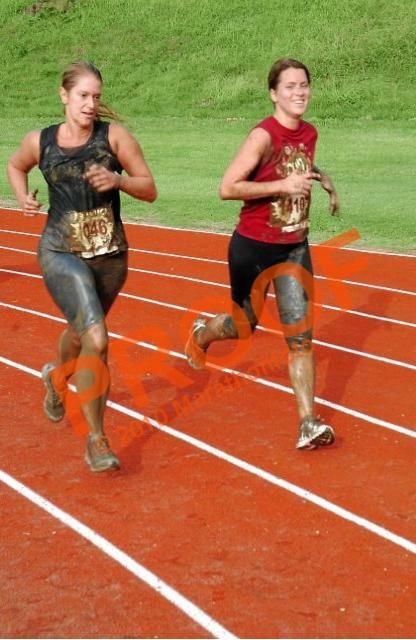 This was the only race I ever considered quitting, because I just wasn’t feeling good. At the end, I did get a PR, and was running a lot faster than I thought I was, but I felt sick after crossing the finish line, and ended up going home and promptly collapsing in bed. In other words: I’ll never run when I’m sick again! Wow!! you have some great race reports from the races here! I just started running this year, and just did the Marine Corps 10K! !